American Express Platinum Canada Worth It? Update: The Platinum Card is now offering 75,000 Points as a Signup Bonus! In my opinion, the American Express Platinum Canada Card is the best card out there for travel benefits. As long as you travel at least once a year and manage your credit well, I think it’s a must have in your wallet, even with a $699 annual fee. Now that I’ve actually listed all the benefits I personally use in some way, I realize that this card is simply unsurpassed in the rewards and benefits that it give you and in my opinion, well worth it. You can earn 60,000 points Membership Rewards® Points with $1,000 of purchases within the first three months. At the very least, this is worth a minimum of $600, as you can redeem your points for travel at the rate of 1,000 points = $10. For one of my transactions with BA Avios, the taxes were only $15.63. I could offset this by using 1,563 points. However, I personally wouldn’t do this. I find WAY more value by transferring the points to Aeroplan or Avios points, where I personally get at least 1.5 cents or more with redemptions in international business/first class, or expensive direct short-haul flights. 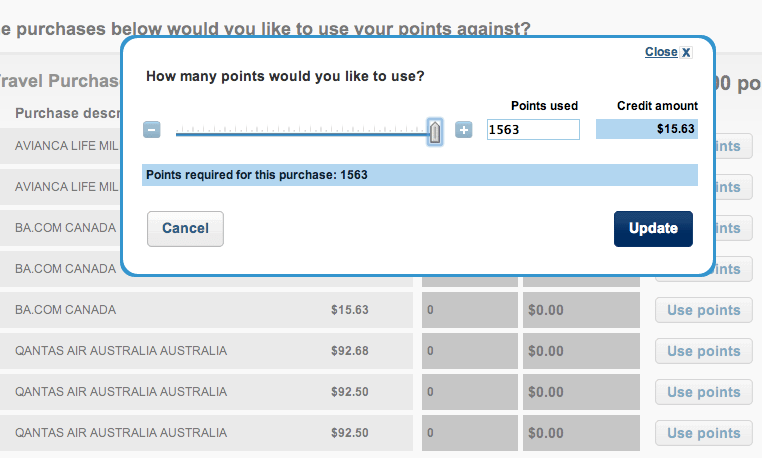 I personally would value 60,000 points from the card closer to $750. If you do want a card allows you to offset your travel by “paying with points”, you’re probably better off getting a card such as the Scotiabank Gold American Express card, as you can effectively get up to a 4% (instead of 1% with Amex pay for points) rebate on your purchases. American Express Fine Hotels and Resort Rates are rates for luxury properties around the world which include special amenities such as late checkout, room upgrades, and some form of spa/dining/resort credit around 100 USD. These rates are offered only to American Express Platinum Canada cardholders, and not any other card line in the Amex Canada family. The room rate is generally the same price as the best flexible rates at most hotels, so you’re not paying more than if you booked directly with the hotel/chain. FHR rates have been immensely useful for me, as the value of these amenities are usually a significant rebate on the rate itself. There are plenty of luxury properties out there which have rates of $200-300 USD a night, so these benefits often are a 30-50% rebate on the room rate itself. If you stack this with a promo or hotel chain elite status, the value becomes even better. You can use a Virtuoso agent but I find that American Express has much more standardized benefits and a larger collection of chain properties. For more about luxury hotel rates, check out this more detailed post I’ve written. The American Express Platinum Canada also offers a $200 travel benefit on travel booked with the Platinum Travel Service. There are many reports that the travel service you deal with on the phone is quite a hassle as they usually aren’t able to match rates for hotels/flights/cars so in my opinion I’ve always redeemed my credit for FHR rates, which reduces quite a lot of the hassle especially since you have to call into book FHR rates anyways and you can only access these rates with Amex, so you aren’t paying more than you should. Note that this credit is per calendar year, which means if you apply now you can get two credits – one this calendar year and one the next. I’d say Club Carlson and Starwood both offer fairly similar benefits to most other mid-tier hotel elite statuses which include free internet, late checkout, room upgrades, and an elite phone line. To get the most benefit from these lounge access privileges you do have to fly a lot, but I’d say any of these three programs are extremely useful and just absolutely unmatched by any other Canadian credit card product. This is in addition to the Cathay Pacific Marco Polo Gold Elite status which is only available if you submit the enrolment forms before March 31, 2014. This will extend your elite status until January 2015. If you haven’t gotten the card yet, I’d say today is probably the very last day to apply for the card, assuming you get the card in a week and have two days left to send the form. The card is definitely worth it’s weight in gold, as you have access oneworld business class lounges, priority check-in, and other nice things that come with airline elite status. As mid-tier elite status it’s basically equivalent to flying around 40,000-50,000 elite qualifying miles (minus the free domestic upgrades that come with a US Airline elite program) so it’s extremely valuable as well. The American Express Platinum Canada card also offers lots of other travel benefits including specific cruise privileges, car rental elite statuses, and even a golf membership. As I am not over 75 or any other senior age, most of the travel medical insurance offered by the American Express Platinum Canada is as good as any other Visa Infinite/World Mastercard. Some other cards might have slightly longer coverage periods or higher limits for certain claims but the Emergency Travel Insurance, Trip Cancellation, Trip Delay, Trip Accident, and Baggage Loss that the card offers is very comprehensive to protect you on trips. That is really cool, and something I didn’t even realized existed until I dug into the insurance policies to write this article! Buyer’s Assurance® Protection Plan: Doubles the manufacturer’s original warranty up to one additional year when you charge the full price on eligible purchases to your Platinum Card. This applies to products purchased with the Card anywhere in the world, provided the manufacturer’s warranty is valid in Canada and the U.S. and does not exceed five years. This is extremely useful for me as well so for purchases like my Macbook Air it’s a good extra year of warranty for my laptop without having to pay additionally for an extended warranty. Hotel/Motel Burglary Insurance: Coverage of up to $1,000 against the loss of most personal items (excluding cash) if your hotel or motel room is burglarized. I’m assuming the hotel will cover your loss if a theft occurs in your room, but who knows. Car Rental Theft and Damage Insurance: Covers for damage or theft of your rental car with an MSRP of up to $85,000. The full list of insurance benefits are available at this link. It’s really hard to quantitatively decide how much each benefit is worth numerically because everyone puts a different value. But in nearly all cases the American Express Platinum Canada is simply the card with the widest and most comprehensive amount of benefits. It is simply the best card for benefits in Canada. They definitely add up for me as I do think it is worth paying the annual fee of $699 for all these benefits. But even if it might not be worth it for you, the signup bonus of 60,000 Membership Rewards points and the 2x $200 Travel Credit already cover well over the $699. I hope this was a good list of all the reasons why you should sign up for the Platinum card! If for some reason you just don’t find value with the Platinum, American Express Canada also offers the Gold Rewards card and the AeroplanPlus Gold card, which offer 25,000 Membership Rewards Points, and 30,000 Aeroplan points respectively as a signup bonus. Both cards have annual fees waived, so it is definitely worth getting if you already haven’t applied. Just as a heads up, Amex has pulled the Marco Polo applicatiom welcome package applications out the Welcome Packages already. You do have to call and they will send the for which then can be faxed back. It is just going to take you more time to get it in place, so don’t delay. I just called amex and they said they can’t pull up the form to send to its members anymore. So I think it is officially over. Don’t take finding the form as the answer. It is a preprinted form that has been pulled out of the new members package that is sent out. It is available till 31 Mar 14. Call back and get another agent. They can fax it to you. They cannot do the application over the telephone as they need a signature. Who do I call?? Do you have a number? Just call the 800 number, but now I would get them to fax it to you and then fax it back immediately seeing as it is 27 Mar already. I assume you received the book with your card. Call concierge and they will help you. Or the number on the back of your card! Their phone system only allows you to speak with someone if you already have a Marco Polo number. Thanks for info. I did as you said; I called American Express, they faxed me the form, I uploaded it to their site, and I’m in the club. You state “Some other benefits I do not believe are offered by any other cards (or very few)” are actually offered on many cards. The Buyers Assurance and Purchase Protection plans are available on almost all Canadian cards with an annual fee and even some with no annual fee while Hotel Burglary is less common but still readily available on cards from Amex, RBC, Scotiabank and the new TD Aeroplan cards. Is it possible to use the Cathay status to access priority boarding, lounges, etc., without accruing the miles to the Asia Miles account? I.e. 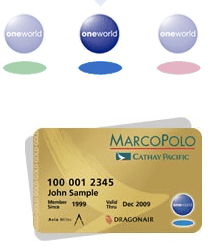 when I flew on Dragonair, they needed to put the Marco Polo Club membership number into the system to give me the boarding pass with priority boarding, the preferred seat and to print the lounge invitation. As a result, I accrued the miles to my Asia Miles account. I would prefer though to get the benefits but accrue the miles to my American Airlines account. Is that possible? You can put in your CX Gold number first to get elite status benefits, then get an agent to switch your number to an AA one at gate to earn AA miles. 1. Platinum Travel Service also gives you a 10% discount on Westjet fares. Not much but at least somewhat useful for flying around Canada. 2. The travel insurance/baggage loss/etc. may or may not cover you when on points redemption travel. There have been varying accounts on this regard on FT about coverage when traveling. Some people got reimbursed, and some people did not. This is a bit unclear. 3. As pointed out, there are other cards offering same or better benefits for the travel insurance. The CIBC Aerogold card has better travel medical insurance as it does not require the trip to be charged to the card to use (i.e. good for points travel). The Hotel Burglary one is a good benefit, as is the higher luxury rental car LDW insurance. I believe that Amex Plat has one of the highest PPP/BAPP limits though. 4. You missed out on Amex Concierge! They can help you get bookings at restaurants that may be hard to get into, as well as tickets for sporting events, concerts, etc. Handy to have someone to call to help arrange for flowers, anniversary, gifts, finding local attractions and other things. This can be hit and miss but I’ll be trying out their restaurant booking and local attractions guide during my trips this year. 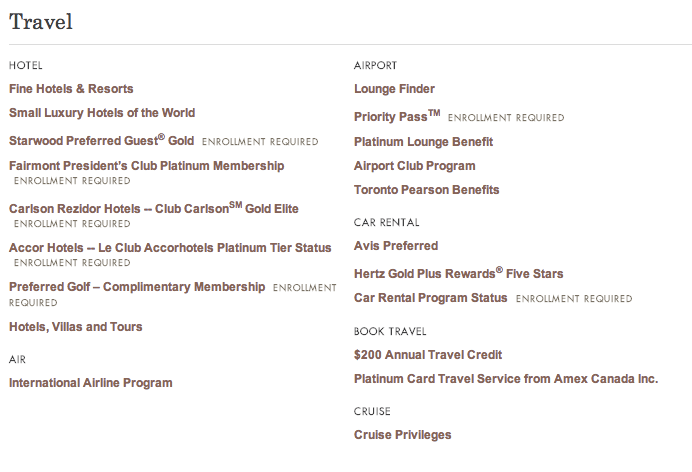 The version of Priority Pass associated with AMEX Canada Platinum does allow a free guest. Simply relax and unwind in any of our 600 Priority Pass lounges around the world. Simply present your Priority Pass membership card (which you will receive after you enroll) and a ticket valid for travel on that day on any airline, regardless of class of service. If you’re travelling with a guest, he or she may accompany you free of charge. 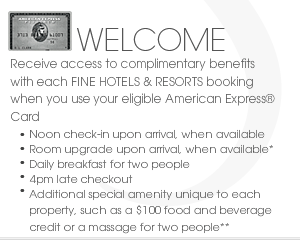 For each additional guest, a nominal fee of $27 USD per person per visit will be charged to your Platinum Card. Do they charge a foreign transaction fee? If yes, are you aware of any card that does not? Thanks. Unfortunately they do charge a foreign transaction fee. All the Chase Canada cards don’t charge one, if you’re looking for a card with no FTF. Am I getting something extra? The credit is per calendar year. So that means you get 1 $200 credit for 2014, and 1 $200 credit in 2015. So if you get a card now, you can get the credit for this year for a booking through the PTS. Then next year, you can get it again in 2015 which means you get 2 over in your first year of getting the Platinum. In reference to comment #3..If you do not fly at least one sector on CX within a year you will loose the Gold Elite Status Just saying! I have been a CIBC Aerogold Infinite card holder since 1993. Over the years have used all or most of the services offed. CiBC does not place any value on the Card Only Members and I have been told specifically I am not a CIBC customer. The perks and rewards on the Platinum Card so exceed Infinite,Lounge Passes, high tier memberships, $200.00 travel credit…need I go on! Now I call Platinum only to be treated as a valued member. Don’t waste the time people considering…Just do it, you will not have a regret. Jeff, I applied and was approved! Thanks! However, I came across an issue – are you aware of it? and it says the same thing but adds that spouses are included. You can call AMEX and ask but I’m fairly sure visits are limited to the Priority Pass holder only – see this link: https://www.prioritypass.com/Join/What-it-costs.cfm. The plat gives you a free prestige membership card which does require the guest to pay for entrance. As Priority Pass is the actual lounge operator, I’m assuming their rules would apply. I have had the AMEX Platinum Canada and its associated Priority Pass membership since August 2013. Though I did have to agree to the “companions will be billed $27” term that PraiseCanada mentioned, my experience is that I am not charged for a guest. You should not have any problems getting the advertised complimentary guest. Hi, I am just wondering how can I book the Fine Hotels and Resorts, because I found the website is only available for US-card member to show the availability and price. Yes, as I mentioned, you can’t book these online but generally FHR rates are similar to the best flex rates on their own website. You’ll have to call in to book. Just got approved for AmEx Platinum and downloaded the Marco Polo/AmEx application. Instead of faxing it, PraiseCanada uploaded his application to the AmEx site. How did you do this? (Through the secure email?) I don’t have my Platinum card yet…won’t have it until next week, but throught I would send the application now.,…before March 31! You can send them a secure message, but I’m not sure whether they’ll approve the application before you get the card. I have a question about Hertz FIVE STAR membership. I followed the online enrollment of Amex to register the hertz membership, however after finished, it just showed the normal membership tier of Hertz. I am just wondering whether they will entitle you directly to the five star membership or they will offer those privileges (upgrade, extra 4hrs rental etc.) as long as you quote the CDP number even though you are at normal tier (just show the platinum card)? Not sure if it still applies (and I can’t even rent cars yet ;)) so hope this helps. Just got approved for platinum card through your link. Thank you for the great info! I just applied and was approved through your link, but the $400 first year credit is not stated on the benefits. Is it $200 this year and $200 next? That’s correct. You’ll need to call the Platinum Travel Service to apply this credit. Thanks for the support! I’m about to bite on this card, but your list says “cruise privileges “. I can’t any info anywhere on what these are. Do you have a link to the amex website where this is clarified? I had read elsewhere that only the US platinum card had this. Thanks. The cruise privileges benefits are generally an upgrade, onboard credit, or a special amenity that you get when booking cruises with the Platinum Travel Service. You can see the complete list of cruise privileges in my post here: http://wp.me/P4Lz5F-Op. You can subscribe through the RSS feed, or signing up for my email newsletter.